Sometimes I buy flowers at the grocery store just so that I can photograph them. And then I get to share them with you. This bouquet of 6 roses was $6 and even though roses aren’t my favorite it was a good deal and I knew they’d brighten up my dining room (and blog!) for a bit. I hope your weekend is bright! Make it a good one. Your photos always brighten up my screen! Stay cozy this weekend. I’m not a big fan of roses also but those are beautiful color. Pretty!! You have some very special flowers there. 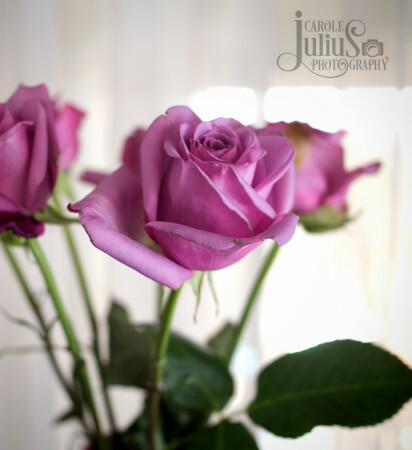 Did you know that until about 20 years ago there was no true purple/lavender rose? It’s a lovely photo – just what we need for a rainy weekend. Shocking! These roses are not red, white and blue! Like everyone else, I love the color! Happy weekend! What a beautiful color (and it doesn’t hurt that they remind me of summer)! Such a great color! Happy Friday and Happy Weekend! Something colorful and blooming and perhaps even fragrant!